Everyone is wearing this coat and we've found a version that is totes on trend but won't leave you completely out of fashion. Have you noticed the coat that everyone is wearing? It's a completely functional, practical warm piece but it has taken off as a style status symbol. It's also very much accessible on the high street and because it's a sleeper hit, there are plenty to go 'round for everyone. Because we're reaching the end of the winter - in the fashion world's point of view only, mind you - some of them are even on sale. Here's Irish blogger Lauren Arthurs wearing the coat everyone's wearing: the Teddy. The teddy coat has been around all winter season in various colours and lengths. 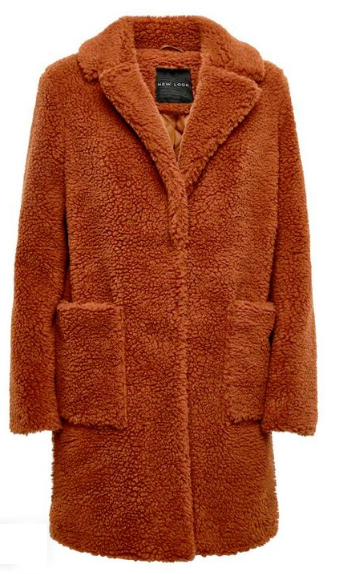 It's the rust mid-length coat, though, that has really enamoured the cool girls Instagram over. The things about rust is that it is a neutral colour that will go with all of your outfits, especially 'traditionally' wintery ones in blacks, navies and greys. It also looks really cool clashing with colours like green and especially electric blue. This is the one we found in the always reliable New Look, for €50. It's a good one to keep around for a while. Imagine it completing your festival look on one of those summer days when it's actually freezing? It will definitely serve you well up to autumn as well. Coming into the cold months, how handy will those pockets be? Do you recognise the rust coloured teddy coat? Do you want one for yourself or were you an early adopter?